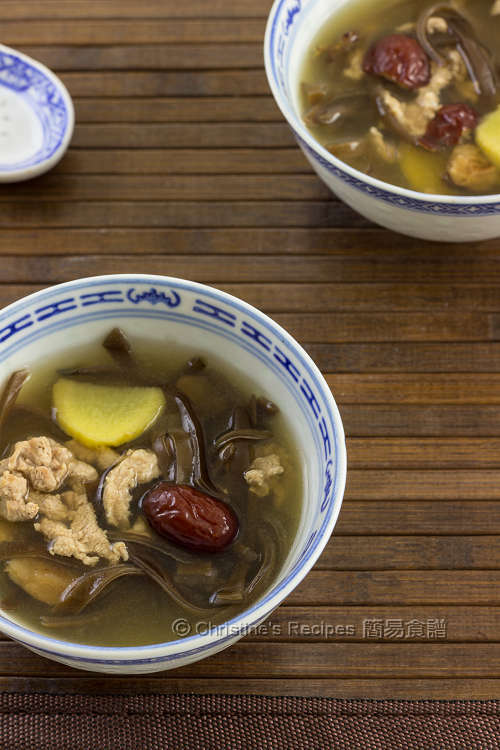 This wood ear and red date soup is suitable for women in the first month after childbirth, served as confinement food. Nevertheless, it’s good for anyone, female or male adults in the family for its nutrients. Wood ear is widely used in Chinese cuisine as it helps to reduce blood pressure, clear away cholesterol, thus improve blood circulation. Chinese people also name it as “blood vessel cleaner”. 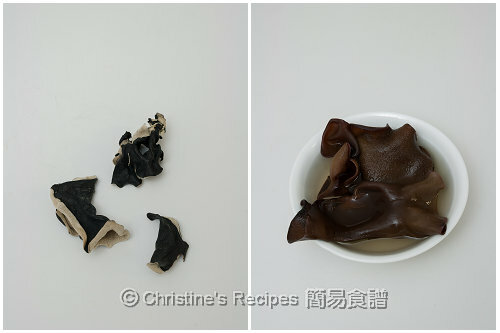 Wood ear contains rich protein and vitamin B, but low in calories. As for cooking, I love its smooth and crisp texture. When it’s cooked longer, it will turn to be soft and slippery. The price of wood ear is not expensive. You can easily get it from any Asian grocers. When it comes to cooking wood ear, it’s downright easy. Simply soak it until it becomes soft, then you can cook it with other ingredients. I often put some wood ears with water in a container, and keep it in fridge for whenever I need it. Left: dried wood ears. Right: soaked wood ears. Blanch the wood ear in boiling water for about 3 minutes. Drain well. Remove the hard stem and shred into strips. Mix the pork with marinade. Set aside. Use a large pot to bring the water to a boil over high heat. Add wood ear, red dates, ginger. Cook with cover. When it boils again, reduce the heat to medium-low. Continue to cook for about 20 to 25 minutes. Add the pork and stir to combine. Bring it to a boil again. Season with salt if necessary. Enjoy ! The wood ear I used looks white on one side, called “白背木耳”, literally means "white back wood ears". Chinese people believe this kind of wood ear is more nutritious, also available at Asian grocers. For convenience, you can get some deseeded red dates from Asian grocers. In Chinese herbal medicine, ginger can help expel cold and wind from our body, thus fortify a balance if our body is weak. I use woodear in my cooking quite often but have yet to try it to make this soup. Thanks for sharing! I have the same bowls at home! :P I want to try making this today for my bf as he's quite sick and I heard red dates are very good for sickness :)/ Thanks for the recipe! Christine thank you for adding the health benefits of these ingredients and combinations. I am fascinated by eastern medicine. This is a soup that my mother used to cook for us. It has a long tradition in our Chinese community. Really works for us. Hope it helps you too. If I wanted to replace the pork with chicken, would the marinade and cook time be the same? About the same. It won't be any problem. Thanks, Christine! Here in Sydney, there’s a lot of nice fresh black woodear mushrooms in the market. Do you think it’s fine to use those? I’ve only used them for 涼拌黑木耳. Thanks!! 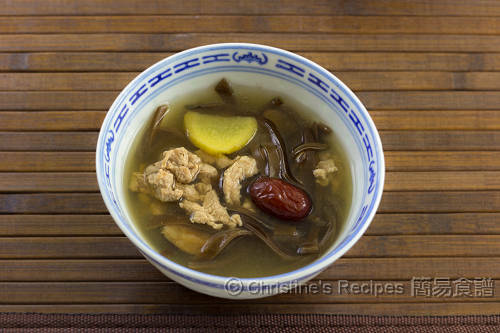 Sorry, I haven't tried fresh black woodear mushrooms to make this soup. I always use the dried woodears.